Today we’d like to introduce you to Robert Schaeffer. My story is somewhat simple. I raced motorcycles since I was a kid and was exposed to a lot of different types of racing and one of them was the vintage flat track class. There is when I saw guys on vintage bike in all vintage leathers. I started slowly buying and selling the old leathers and boots and some other odds and ends. Over time I stopped racing and worked normal jobs while increasing all my vintage buying and selling. Fast forward to I moved to Los Angeles in 2006 to re brand a vintage dealer store whom I knew from selling vintage to over the years. I knew nothing about owning a store but knew I was going to rebrand his business I think it should be. He also had a denim repair service there that was suffering so apt of my focus went into learning that craft and re building the customer base. I left after 4 years to open my own shop and along the way saw that no one had a denim brand out there that I wanted so I started one at my new shop along with our other services. I saw at my years at the other store that only American denim brand needed repair as the fabric wasn’t made well but the fits were always great and all the Japanese brands never needed repair but always requires new fitting. So, I made an LA based denim brand using denim repair in a tailored classic current fit. We have since then grown the line to tee shirts, hoodies, crew sweatshirts as well as we carry a few friends acc line and a large collection of our 1920-1960s vintage leather jackets and boots. But one of the best parts of our brand and store is the 18-year long hat maker names Gunner Foxx. He is a third-generation hat maker from LA and if you know hats you have heard of him. He creates all his hats only through SGH since 2009. Gunner and I have a great working relationship and our long-term vision of quality before quantity is aligned between us. Gunner creates hats for films, celebrities and any one that has a love of hats. SGH would not be what it is without him. In the end a lot of brands blow up and burn out and we just want to stay quality for years to come! The road has not been easy but it has been worth it. I feel if you don’t whore out your clients and keep integrity in our business it makes for a slow long road to success. It seems these days that selling out is the way to get ahead and I just don’t share that view in any way. To do things right you have to follow your heart and gut and that’s what I did from product quality to privacy of our client list from when it was small to where it is now. Schaeffers Garment Hotel – what should we know? What do you guys do best? What sets you apart from the competition? We are a in house made denim based brand. We own our own private manufacturing facility on site above our retail store. We make every garment ourselves from start to finish and will tailor fit every garment we sell to the customer’s specifications. Beyond that we offer an extensive warrant and we will offer one re fit tailor service at the one year b day of the garment after it’s sold. All of our denim is imported direct from Japan, and our knits will be sourced from USA Japan or Canada. 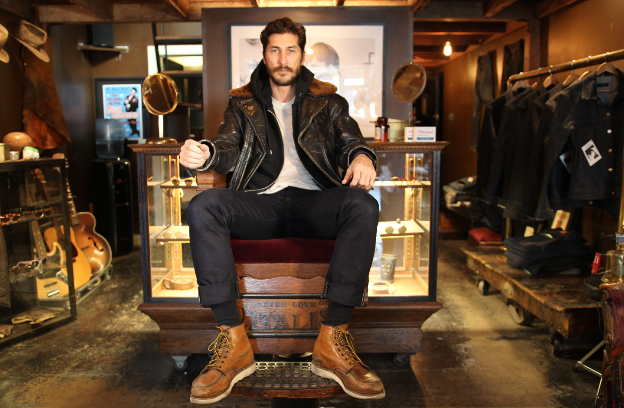 We also carry select 1920s-1960s leather jackets, boots, and eye ware. Along with all our brand and vintage we do full denim repair and alteration local and mailed in to us from all over the country. I would say most people know us for the custom denim and hats we offer but as time as grown we seem to be recognized as a full custom handmade brand without any smoke and mirrors. We do what we say, and make sure every customer leaves happy from garment quality to their personal fit. I would say I most proud of the measure of quality that people know us for and our commitment to make sure each garment is done perfect for each individual, that’s not an easy reputation in the fashion world to get. I think success for me is defined on the people around you and if people value you for what you stand for. To me that means that I did my job. Address: 7517 west sunset Blvd.